Toward the beginning of the biopic “Trumbo,” National Book Award winner Dalton Trumbo (Bryan Cranston) signs a contract with MGM for $75,000 per script, making him the highest paid screenwriter in Hollywood. As Trumbo inks the contract, one of the studio executives in the room praises the happy endings in his profitable screenplays and asks that he tone down his leftist politics, which are providing fodder for vicious right-wing gossip columnist Hedda Hopper (a wonderfully poisonous Helen Mirren). Establishing the tone for the conflicts to follow, Trumbo drily suggests that the man stop reading Hopper. The setting is America, 1947. After spending 14 years in the political wilderness during an extended thrashing at the hands of Franklin Deleanor Roosevelt, the Republican Party has re-taken control of Congress following the 1946 off-year elections. Capitalizing on their newfound political power, they have begun highly publicized show trials. The scapegoat of the moment is Hollywood Communists, people who in no way threaten U.S. national security that are nonetheless convenient, high profile targets of the GOP campaign of fear. Propagandistic anti-Communist newsreels from the time are embedded in the dramatic narrative to show the (manufactured) mass hysteria of the era. Alliance for the Preservation of American Ideals, where he hands out First Amendment literature and confronts the keynote speaker, John Wayne—who had just finished a bombastic speech about protecting “the American way of life”—for being a macho posturer who had never served in uniform. While his politics are radical, Trumbo lives a relatively traditional home life with his wife and three children on the Lazy T Ranch (a secluded little patch of heaven 70 miles northwest of L.A.) until a subpoena arrives from the House Un-American Activities Committee. Appearing before Congress, Trumbo doesn’t flinch. Unlike many self-serving cowards, he doesn’t name names to protect his career. Neither does he cite the Fifth Amendment, as he has committed no crime. Rather than giving a direct response to the question of whether or not he was or has ever been a member of the Communist Party, Trumbo says, “I shall answer in my own words” and expounds on his First Amendment right to believe what he wants to believe. As he speaks, the black and white visual plane colorizes, as if to symbolize the way Trumbo is suffusing the grim and primitive with-us-or-against-us world of his foes with truth and light. blacklisted by all of the major studios. He has to sell the ranch and move into a middle-American neighborhood, where he is harassed with love it or leave it hate mail and dead animals in his pool. Desperate to support his family, Trumbo takes the only work he can find, as a low-paid, grunt screenwriter for a B movie studio headed by Frank King (John Goodman, who fills the screen with full bluster). One condition of his indentured servitude is that his name isn’t attached to the scripts; his work is published under a dozen-odd different pseudonyms. 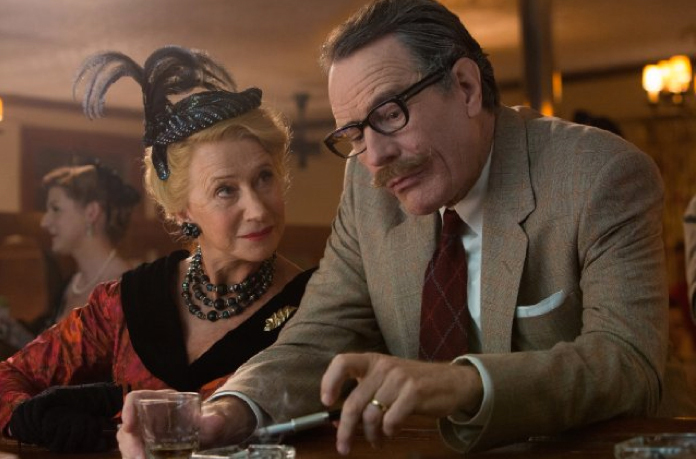 As Trumbo grinds away on stories about a man in a gorilla suit and an unlikely romance between a farmer’s daughter and an alien, the movie effectively conveys both the beauty and the drudgery of professional writing. 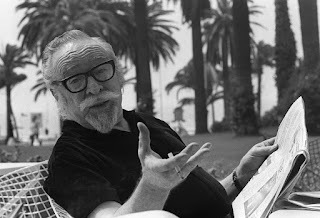 While Trumbo is perched at his typewriter, jazz comes on like so many crackling synapses, ideas churning, and yet the work is exhausting: Trumbo smokes, slurps whiskey, and swallows bennies just to keep up, and his fixation on scripts—to the exclusion of all else—causes rifts within his family. Despite his workload, Trumbo makes time to write a serious screenplay on the side. 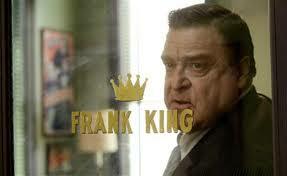 To conceal his identity, the script is submitted by a front, Trumbo’s friend Ian McLellan Hunter. Paramount buys the “Roman Holiday” screenplay for a sizable sum, and in 1954, Trumbo wins the Academy Award for Best Original Story—though the world doesn’t know it. The statuette is publicly accepted by McLellan as Trumbo and his family watch the event on television. After many years of toil and persecution, Trumbo is on his way to beating the blacklist. When we later see his name in the credits on a movie screen, we feel relief, and a sense of social justice, but Trumbo is the exception to the rule. Most of the other victims of the blacklist—43 of whom were veterans—suffered creative ruin and in many cases, premature deaths. 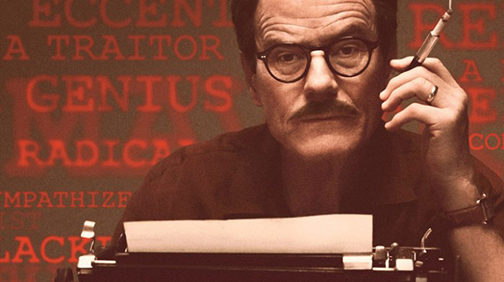 Props are due to Bryan Cranston for putting his bankable name behind this project, and to director Jay Roach, who has brought together an A-list cast and a sharp script to make a film that, sadly, is all too relevant in 2015. All these years later, Republican attacks on The Other continue apace as GOP presidential candidates aggressively scapegoat the LGBT community, Latinos, and Muslims, showing that the home of the brave continues to be a cauldron of ignorance and fear a half century after the blacklist petered out.